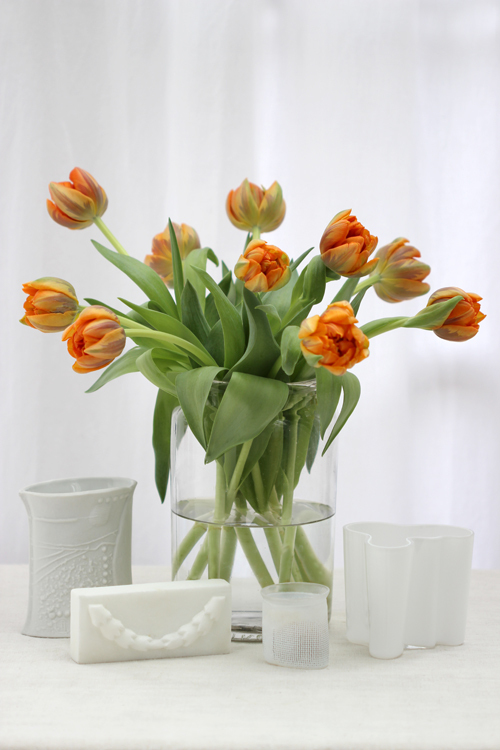 This week on Creative with Flowers - I'm featuring a bunch of orange tulips. Tulips are now starting to appear on the flower stalls. I always find them a very welcome sight. They are one of my favourite flowers and I think they are great to work with. Ten stems of colourful tulips plonked in a clear glass container. What could be easier? 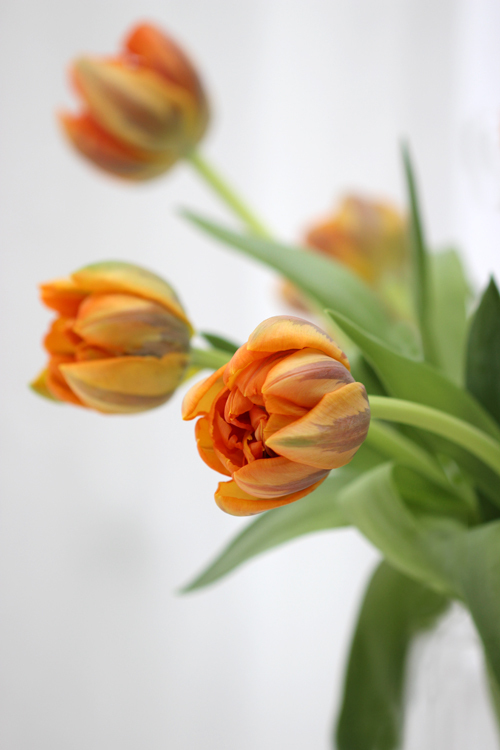 This one is called Tulipa 'Orange Princess'. 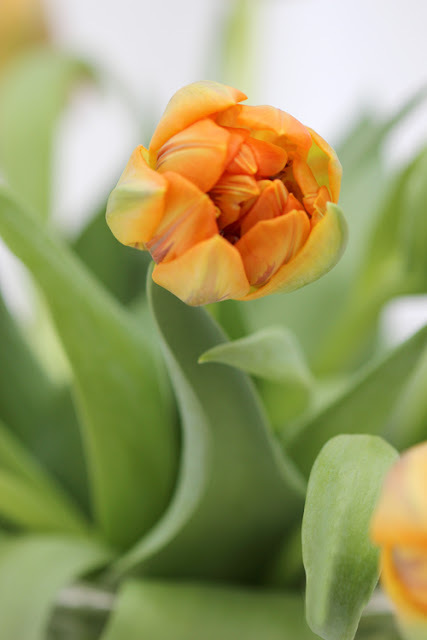 It's a double tulip instead of the usual single petals that most tulips has - double tulips has many layers - giving the flowers great depth and fullness. 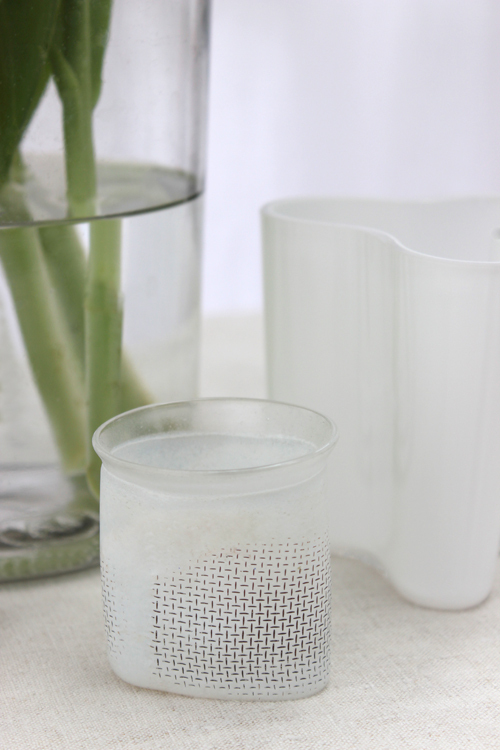 Joining the tulips are three Scandinavian vases all white and minimal in their design. Well, what do you expect - after all they are Scandinavian! From left to right: White ceramic vase with an abstract pattern on the sides by the Swedish artist Bertil Wallin. Next is a piece of white marble with a carved garland as decoration. I have no idea what it was used for, how old it is or where it's from. 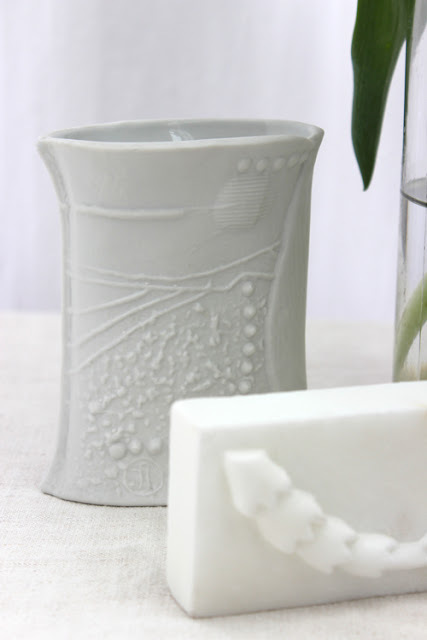 The small glass vase is also by Bertil Wallin and on the far right is a small mini version of Alvar Aalto's Savoy vase. Tulips will be available for many months now. Remember to give them plenty of water. They also keep growing in the vase so the arrangement will slightly change over time. If possible keep them in a place that is not too warm and put them somewhere cool over night - and they will last much longer. If you can re-cut the stems and give them fresh water every 1-2 days. They will last approximately 5-10 days. 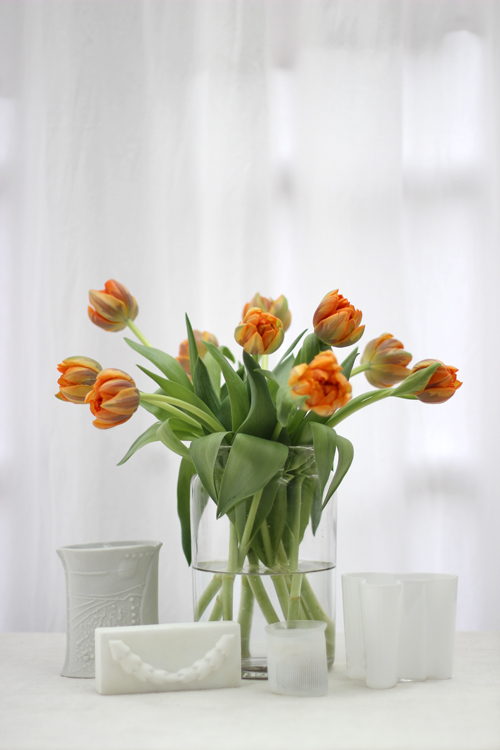 Tulips are great for a dining table as they are not too tall - people can see each other across the table. 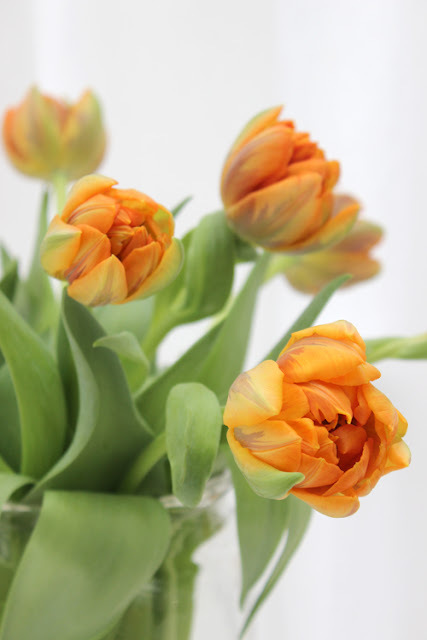 A colourful tulip arrangement will work in almost every room in the house - just think about tying in the colours of the flowers with colours already in the room. Thank you for visiting 'Of Spring and Summer'. I will be back later in the week. Hope to see you then.